I was referring to cage traps as in the things in real life upon which your animal trap tiles appear to be based. The fact that cage traps are also a thing that exists in DF could perhaps be seen as an argument against making animal traps also be traps which are cages, but that wasn't what I was getting at. Yep, unless you're about to tell me that it's supposed to be a windmill, it reads clearly. I'm wary of how things will look in practice (a top down waterwheel next to a side-on screw pump?) but independently of one another, they're quite good. Sounds like a lot, but if you consider that shorter ones are basically just moving the end up a pixel, it's really just 17 sprites (for each style/type combo) with eightish variants each. This is exciting! I'm a longtime Ironhand user, but I'll certainly be buying and trying the new graphics version. Is there a plan for color coded levers/constructions in the new graphics? That's one huge quality of life issues for me; being able to have levers be really visually distinct and match the color of corresponding doors/bridges/floodgates. Plus it was a fun challenge to find/smelt/import enough materials to produce things in each color. I typically go as far as having my stone quantum stockpiles sorted by rock color so I can easily see when it's time to search/trade for more kaolinite, cinnabar, garnierite, or give up on pitchblende purple and smelt more black bronze. Is that approach to material colors still the plan? How about for color-coded workshops, mostly for aesthetic purposes? I'm also excited to see how you tackle wormy tendrils! I agree with the people who want actual clothes represented. 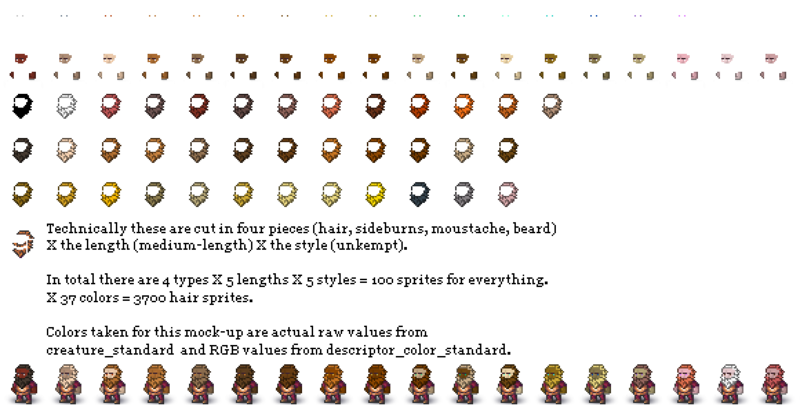 I never care about professions, they make it nice on tilesets to make dwarves look like individuals, but sprites matching physical descriptions of dwarves should be enough for me to tell them apart. I'd much rather know what people are wearing even if it's uninteresting. Maybe I'm an outlier but my dwarves are always wearing varied clothes bought from traders or accumulated from sieges or whatever, then they wear them until they rot. I would much rather see when dwarves need shirts, shoes or pants than see that they are one of the 20 professions I never make use of. I like the idea of them all looking like peasants in crappy clothes, and to see that some of them love bracelets/amulets/crowns and just keep stacking them on, or one weirdo who wears nothing but gauntlets and a helmet. If profession is important I'd rather there be a different way to recognize it. Some games do the displayed names floating over or under units as they move around, something like that would be good to me. Maybe that could be moddable- options like Unit Display Options: Full Name, First Name, Last Name, Nickname, Profession, Name & Profession. Thanks! Glad to see that there is likely to be significant diversity in dwarven appearances! On a side note, I'll also throw in my support for the 'actual clothes instead of professions' side. I never personally found profession info to be too important. Clothing: based on actual clothing. Trees: original, isometric. They look pretty to me, and I think shading the interior black would help differentiate them from stumps, as someone else suggested before me. The newer, 2D version looks strange and unsightly, in my opinion. I definitely like the experimental tree shadows. Critter sizes: relative sizes represented, at least to some degree. Slopes: Mayday's, though Meph's are a close second. Also, a minor, offhand suggestion related to the experimental tree shadow - maybe having the game sometimes add a fake 'god ray' effect underneath the tree. It would just be two random, translucent streaks of light that would spawn occasionally beneath trees, but might be able to add to the 'fantasy primeval forest' vibe in sufficiently dense woodland. Just randomly tossing ideas around, not sure how feasible any of them all. In general I would vouch for the clothes being profession-based. Sure, I might personally prefer the clothes and all that to be shown in detail to get a more "realistic" view of my fort, but this is still a commercial release with the target audience being new players, who need/want graphical support. I don't believe focusing on the color of a sock should be the kind of graphical support prioritized before the dwarves' professions. You also can't assume the players will have their dwarves wear different clothes, as there is also the option to mass-produce identical clothes locally, and if they don't very little information is gained from looking at each dwarf. Regarding the issue with naked dwarves, it could be solved by simply removing parts off the profession-specific attire, so that a miner lacking upper-body cover will be shown as wearing the miner-specific clothes, but with the shirt part missing. This really comes down to the artist's choice and the sprite size/detail level. For example my set focuses more on higher detail head/faces with smaller bodies. I plan on having different facial features for each skin tone to further differentiate them. Just changing the skin tone and nose size creates a much different looking character, now combine that with things like thicker/thinner eyebrows, larger eyes, and all the possible hair and beard combinations. Its a huge improvement over the existing system of professions. So unless the descriptions are exactly the same you will be able distinguish each dwarf pretty easily even with lower res characters. I doubt this would even occur in a single fort let alone several in a row. To give you a better idea; when I originally made my dwarf set I Frankensteined them in a similar manner to reduce the workload. I ended up with over 350 unique characters. I had trouble choosing which ones to use for the set. I could have easily multiplied this number further, and this was just for male dwarfs. This process of generating entities is 10x that number in potential outcomes, and a huge decrease in the workload of the artist. Pretty exciting stuff for graphics enthusiasts. Thanks Meph that is very helpful. Now to get working on some prototypes. Cruxador: Oh... so what should an animal trap that catches live prey be? I thought it's a tiny cage. I'll change the screwpump to be top-down. I made a north/south aligned one, it looks too different from the east/west one. Red/green and I/O for on/off, for the colorblind players. No idea about colors yet. I do have wormy tendrils, (all grasses in fact), but Mike urges caution from adding too distracting grasses. There are 40 grasses and 7 growths, and the sprites I made for those might be too much. Seems lots of people have strong opinion about profession sprites vs equipped items sprites. Now I'm not an expert in how windmills work, but are the wooden poles supposed to become longer than the panels when the blades are diagonal? I meant that I plan on making 18 different looking faces determined by the skin tone. Four, RGB and black but the latter is hard to get because it's only in evil biomes. But making the dyes actually visible seems like it would bring dye diversification up in priority. Keep in mind that the system decided here is not just for the initial steam release, although it should be good at that time, but is likely to remain the foundation of the game's graphical system indefinitely. They mostly just wear identical items in either brown (leather) or white (pretty much everything else, from pigtail fiber, sheep yarn to silk). Well, an increase from sixteen colors to allow shades of brown and white would be pretty nice. But common colors being common only makes it cooler when you either find an exotic leather, dye your clothing to make a uniform, or get an artifact item of clothing made from gems or something. Personally, I think that the diversity of faces (the skin and hair colors you've mocked up are already quite distinct, and will only become moreso with hair styles and lengths added, even if facial features are probably never going to be representable at this scale) will do more than enough to diversify individuals, and unlike clothes and professions, those don't change. Although I think the styles of clothing are also relevant to appearance, even if colors wind up being similar. Remember the old dungeon master, wearing several cloaks and nothing else? In general I would vouch for the clothes being profession-based. Sure, I might personally prefer the clothes and all that to be shown in detail to get a more "realistic" view of my fort, but this is still a commercial release with the target audience being new players, who need/want graphical support. I don't believe focusing on the color of a sock should be the kind of graphical support prioritized before the dwarves' professions. This is predicated on two ideas that I think are wrong. Firstly, that professions matter. I've already written a bit about this. Secondly, that it is rare for the typical player to care about their dwarves' outfits. For this latter point, I'd like to call your attention to the existence of scores of games with literally no goal other than playing dressup, to the hours that countless people put into designing their characters in RPGs, to the premium that aesthetic items command in MMOs and microtransaction-based games, and to games where dressup has overtaken the original premise of the game, such as Soul Calibur. Furthermore, I would like to point out that megaprojects are generally pointless endeavors of purely aesthetic merit, and that their popularity shows that dwarf fortress players are not immune to a penchant for the aesthetic. You also can't assume the players will have their dwarves wear different clothes, as there is also the option to mass-produce identical clothes locally, and if they don't very little information is gained from looking at each dwarf. If a player wants their dwarves to match, shouldn't that be fine? A cage-style trap can be used for that purpose, but they don't look much like what you depicted. They're smaller and they've got trappy bits at each end - an opening at one that closes, and a trigger at the other, usually with bait. You could also use a snare for live capture, you just have to set a stop or what you catch will usually end up choking out. I'll change the screwpump to be top-down. Good luck with making the slope/directionality look right then, I don't know how I'd go about doing that. In general, I agree with him here, but the evil biome grasses would be the exception. Wormy tendrils and staring eyeballs are supposed to be a horrendous writhing mess. Don't back down from making them that way in the official graphics. Cruxador: Well, players can't play dress-up with their dwarves, because you can't tell them what to wear. Unless you mean via military squads, and assigning individual armor for everything is hidden behind so many menus and such a burden, I don't think people would use it much for ornamental purposes. Professions matter. Not all of them, but for example you see a bunch of miners idling around your dining room, you know you messed up your mining patterns. ^^ Even more so for your nobles. Where is your trader? Who was made king, and why does the king look like any other peasant (if we don't do profession sprites). Is that walled-in vampire really the bookkeeper? Animal-traps: Ok, so it was mostly the detail on the animal trap that was missing. Will the screw pump take on a different appearance based on material, e.g., green glass vs wooden? Well, players can't play dress-up with their dwarves, because you can't tell them what to wear. Unless you mean via military squads, and assigning individual armor for everything is hidden behind so many menus and such a burden, I don't think people would use it much for ornamental purposes. I know it's traditionally ignored when it comes to complex tilesets (and TWBT being crashy probably didn't help that) but with native support I think you're going to have to consider it (or add a paper-doll type equipment screen). People are much more invested in their characters in Adventurer. I don't want my entire party to look exactly the same just because I've armed them with swords. Where's my leader's dashing silk cape and bandana? 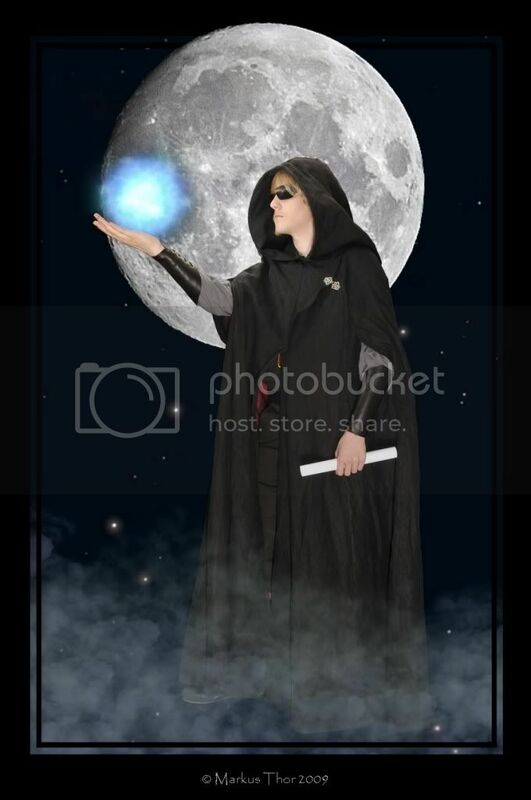 How about the guy in black robes who skulks about in the background? Sorry, that's not meant to sound like a demand. Unfeasible is unfeasible, that's understandable. I just don't think "Not doing it because no player would do it in Fortress mode" is a good enough reason.